Although the term apocryphal had been in use since the 5th century, it was in Luther's Bible of 1534 that the Apocrypha was first published as a separate intertestamental section. To this date, the Apocrypha is "included in the lectionaries of Anglican and Lutheran Churches." Moreover, the Revised Common Lectionary, in use by most mainline Protestants including Methodists and Moravians, lists readings from the Apocrypha in the liturgical kalendar, although alternate Old Testament scripture lessons are provided. The seven books which comprise the Protestant Apocrypha, first published as such in Luther’s Bible (1534) are considered canonical Old Testament books by the Catholic Church, affirmed by the Council of Rome (AD 382) and later reaffirmed by the Council of Trent; they are also considered canonical by the Eastern Orthodox Church and are referred to as anagignoskomena per the Synod of Jerusalem. The Anglican Communion accepts "the Apocrypha for instruction in life and manners, but not for the establishment of doctrine (Article VI in the Thirty-Nine Articles)", and many "lectionary readings in The Book of Common Prayer are taken from the Apocrypha", with these lessons being "read in the same ways as those from the Old Testament". The first Methodist liturgical book, The Sunday Service of the Methodists, employs verses from the Apocrypha, such as in the Eucharistic liturgy. The Protestant Apocrypha contains three books (3 Esdras, 4 Esdras and the Prayer of Manasseh) that are accepted by many Eastern Orthodox Churches and Oriental Orthodox Churches as canonical, but are regarded as non-canonical by the Catholic Church and are therefore not included in modern Catholic Bibles. Jerome completed his version of the Bible, the Latin Vulgate, in 405. In the Middle Ages, the Vulgate became the de-facto standard version of the Bible in the West. The Vulgate manuscripts included prologues, in which Jerome clearly identified certain books of the older Old Latin Old Testament version as apocryphal – or non-canonical – even though they might be read as scripture. In the prologue to Ezra Jerome states that the third book and fourth book of Ezra are apocryphal; while the two books of Ezra in the Vetus Latina version, translating Ezra A and Ezra B of the Septuagint, are 'variant examples' of the same Hebrew original. 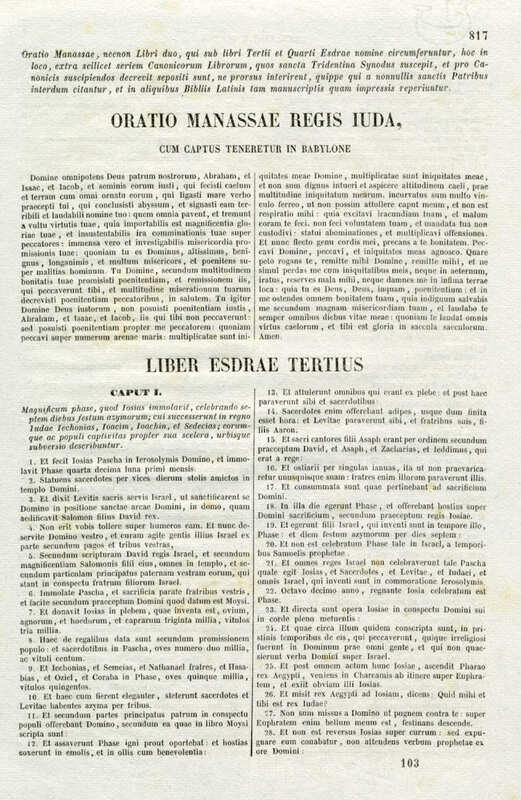 He mentions the book of Baruch in his prologue to the Jeremias but does not include it as 'apocrypha'; stating that "it is neither read nor held among the Hebrews" and should be omitted altogether from scripture. What sin have I committed in following the judgment of the churches? But when I repeat what the Jews say against the Story of Susanna and the Hymn of the Three Children, and the fables of Bel and the Dragon, which are not contained in the Hebrew Bible, the man who makes this a charge against me proves himself to be a fool and a slanderer; for I explained not what I thought but what they commonly say against us. (Against Rufinus, II:33 (AD 402)). This famous edition of the Vulgate was published in 1455. Like the manuscripts on which it was based, the Gutenberg Bible lacks a specific Apocrypha section. Its Old Testament includes the books that Jerome considered apocryphal and those Clement VIII later moved to the appendix. The Prayer of Manasses is located after the Books of Chronicles, 3 and 4 Esdras follow 2 Esdras (Nehemiah), and Prayer of Solomon follows Ecclesiasticus. (Included in this list are those books of the Clementine Vulgate that were not in Luther's canon). These are the books most frequently referred to by the casual appellation "the Apocrypha". These same books are also listed in Article VI of the Thirty-Nine Articles of the Church of England. Despite being placed in the Apocrypha, in the table of lessons at the front of some printings of the King James Bible, these books are included under the Old Testament. In the Zürich Bible (1529–30), they are placed in an Appendix. They include 3 Maccabees, along with 1 Esdras & 2 Esdras. The 1st edition omitted the Prayer of Manasseh and the Rest of Esther, although these were included in the 2nd edition. The French Bible (1535) of Pierre Robert Olivétan placed them between the Testaments, with the subtitle, "The volume of the apocryphal books contained in the Vulgate translation, which we have not found in the Hebrew or Chaldee". All King James Bibles published before 1666 included the Apocrypha, though separately to denote them as not equal to Scripture proper, as noted by Jerome in the Vulgate, to which he gave the name, "The Apocrypha." In 1826, the National Bible Society of Scotland petitioned the British and Foreign Bible Society not to print the Apocrypha, resulting in a decision that no BFBS funds were to pay for printing any Apocryphal books anywhere. They reasoned that not printing the Apocrypha within the Bible would prove to be less costly to produce. Since that time most modern editions of the Bible and reprintings of the King James Bible omit the Apocrypha section. Modern non-Catholic reprintings of the Clementine Vulgate commonly omit the Apocrypha section. Many reprintings of older versions of the Bible now omit the apocrypha and many newer translations and revisions have never included them at all. ^ Bruce, F.F. "The Canon of Scripture". IVP Academic, 2010, Location 1478–86 (Kindle Edition). ^ Readings from the Apocrypha. Forward Movement Publications. 1981. p. 5. ^ "The Revised Common Lectionary" (PDF). Consultation on Common Texts. 1992. Archived from the original (PDF) on 1 July 2015. Retrieved 19 August 2015. In all places where a reading from the deuterocanonical books (The Apocrypha) is listed, an alternate reading from the canonical Scriptures has also been provided. ^ "The books commonly called Apocrypha, not being of divine inspiration, are no part of the Canon of the Scripture; and therefore are of no authority in the Church of God, nor to be any otherwise approved, or made use of, than other human writings." For more details see Development of the Old Testament canon#Church of England. ^ Ewert, David (11 May 2010). A General Introduction to the Bible: From Ancient Tablets to Modern Translations. Zondervan. p. 104. ISBN 9780310872436. English Bibles were patterned after those of the Continental Reformers by having the Apocrypha set off from the rest of the OT. Coverdale (1535) called them "Apocrypha". All English Bibles prior to 1629 contained the Apocrypha. Matthew's Bible (1537), the Great Bible (1539), the Geneva Bible (1560), the Bishop's Bible (1568), and the King James Bible (1611) contained the Apocrypha. Soon after the publication of the KJV, however, the English Bibles began to drop the Apocrypha and eventually they disappeared entirely. The first English Bible to be printed in America (1782–83) lacked the Apocrypha. In 1826 the British and Foreign Bible Society decided to no longer print them. Today the trend is in the opposite direction, and English Bibles with the Apocrypha are becoming more popular again. ^ Ewert, David (11 May 2010). A General Introduction to the Bible: From Ancient Tablets to Modern Translations. Zondervan. p. 104. ISBN 9780310872436. ^ John Wesley (1825). The Sunday Service of the Methodists; With Other Occasional Services. J. Kershaw. p. 136. ^ Henze, Matthias; Boccaccini, Gabriele (20 November 2013). Fourth Ezra and Second Baruch: Reconstruction after the Fall. Brill. p. 383. ISBN 9789004258815. Why 3 and 4 Esdraas (called 1 and 2 Esdras in the NRSV Apocrypha) are pushed to the front of the list is not clear, but the motive may have been to distinguish the Anglican Apocrypha from the Roman Catholic canon affirmed at the fourth session of the Council of trent in 1546, which included all of the books in the Anglican Apocrypha list except 3 and 4 Esdras and the Prayer of Manasseh. These three texts were designated at Trent as Apocrypha and later included in an appendix to the Clementine Vulgate, first published in 1592 (and the standard Vulgate text until Vatican II). ^ "Jerome, Prologue to the Books of Solomon (2006)". ^ "Jerome's Prologue to Judith". ^ Jerome, To Paulinus, Epistle 58 (AD 395), in NPNF2, VI:119.: "Do not, my dearest brother, estimate my worth by the number of my years. Gray hairs are not wisdom; it is wisdom which is as good as gray hairs At least that is what Solomon says: "wisdom is the gray hair unto men.’ [Wisdom 4:9]" Moses too in choosing the seventy elders is told to take those whom he knows to be elders indeed, and to select them not for their years but for their discretion [Num. 11:16]? And, as a boy, Daniel judges old men and, in the flower of youth, condemns the incontinence of age [Daniel 13:55–59 aka Story of Susannah 55–59]"
^ Jerome, To Oceanus, Epistle 77:4 (AD 399), in NPNF2, VI:159.:"I would cite the words of the psalmist: 'the sacrifices of God are a broken spirit,’ [Ps 51:17] and those of Ezekiel 'I prefer the repentance of a sinner rather than his death,’ [Ez 18:23] and those of Baruch, 'Arise, arise, O Jerusalem,’ [Baruch 5:5] and many other proclamations made by the trumpets of the Prophets." ^ Jerome, Letter 51, 6, 7, NPNF2, VI:87–8: "For in the book of Wisdom, which is inscribed with his name, Solomon says: "God created man to be immortal, and made him to be an image of his own eternity." [Wisdom 2:23]...Instead of the three proofs from Holy Scripture which you said would satisfy you if I could produce them, behold I have given you seven"
Herbermann, Charles, ed. (1913). "Canon of the Old Testament" . Catholic Encyclopedia. New York: Robert Appleton Company. section titled "The Council of Florence 1442": "...contains a complete list of the books received by the Church as inspired, but omits, perhaps advisedly, the terms canon and canonical. The Council of Florence therefore taught the inspiration of all the Scriptures, but did not formally pass on their canonicity." ^ "Gutenberg Bible: View the British Library's Digital Versions Online". ^ "1945 Edition of the Luther Bible on-line". ^ Catholic Encyclopaedia, "St. Jerome evidently applied the term to all quasi-scriptural books which in his estimation lay outside the canon of the Bible, and the Protestant Reformers, following Jerome's catalogue of Old Testament Scriptures—one which was at once erroneous and singular among the Fathers of the Church—applied the title Apocrypha to the excess of the Catholic canon of the Old Testament over that of the Jews. Naturally, Catholics refuse to admit such a denomination, and we employ "deuterocanonical" to designate this literature, which non-Catholics conventionally and improperly known as the Apocrypha". ^ "And the other books (as Hierome saith) the Church doth read for example of life and instruction of manners; but yet doth it not apply them to establish any doctrine." ^ "WCF and MESV in Parallel Columns". ^ Grudem, Wayne (29 February 2012). Understanding Scripture: An Overview of the Bible's Origin, Reliability, and Meaning. US: Crossway. p. 90. ISBN 978-1433529993. Retrieved 21 June 2014. ^ Howsam, Leslie (2002). Cheap Bibles. Cambridge University Press. p. 14. ISBN 978-0-521-52212-0. ^ Flick, Dr. Stephen. "Canonization of the Bible". Christian heritage fellowship. Retrieved 21 June 2014. ^ McGrath, Alister (10 December 2008). In the Beginning: The Story of the King James Bible and How It Changed a Nation, a Language, and a Culture. Knopf Doubleday Publishing Group. p. 298. ISBN 9780307486226. ^ Anderson, Charles R. (2003). Puzzles and Essays from "The Exchange": Tricky Reference Questions. Psychology Press. p. 123. ISBN 9780789017628. Paper and printing were expensive and early publishers were able to hold down costs by eliminating the Apocrypha once it was deemed secondary material. ^ a b Vassiliadis, Petros (2005). "Canon and authority of Scripture". In S. T. Kimbrough (ed.). Orthodox and Wesleyan Scriptural understanding and practice. Crestwood, N.Y: St. Vladimir's Seminary Press. p. 23. ISBN 978-0-88141-301-4. ^ Gilmore, George William (1916). Selections from the World's Devotional Classics. Funk & Wagnalls company. p. 63. Porter, Frank C. (1898). "Apocrypha". In James Hastings (ed.). A Dictionary of the Bible. I. pp. 110–23.